Dr. Haug & Kollegen GmbH & Co. KG is flexible to possible changes. 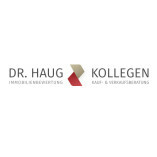 Dr. Haug & Kollegen GmbH & Co. KG keeps agreed-upon appointments. Dr. Haug & Kollegen GmbH & Co. KG works within the agreed-upon budget. 05/16/2018Dr. Sara Laszlo und Prof. Dr. Roman L.